Often times, lenders focus on how they’ll sell a prospect on a loan when they have a conversation with them. It’s the simple idea of having a sales pitch ready when a potential borrower walks through the door. But what many lenders might not realize is the number of borrowers they could be losing before they’ve even had a chance to talk with them at all. When submitting a mortgage application, the experience a borrower goes through is the first thing that determines if they’re going to stick through the entire online application process, and having a slow, time-consuming, 1003 applications can cause a lot of borrowers to stop the mortgage process when they’ve only just started. Having a standard application process that takes a lot of time and effort from the borrower can really hurt conversion rates. The more automated and intuitive the process is though, the better off you’re going to be. 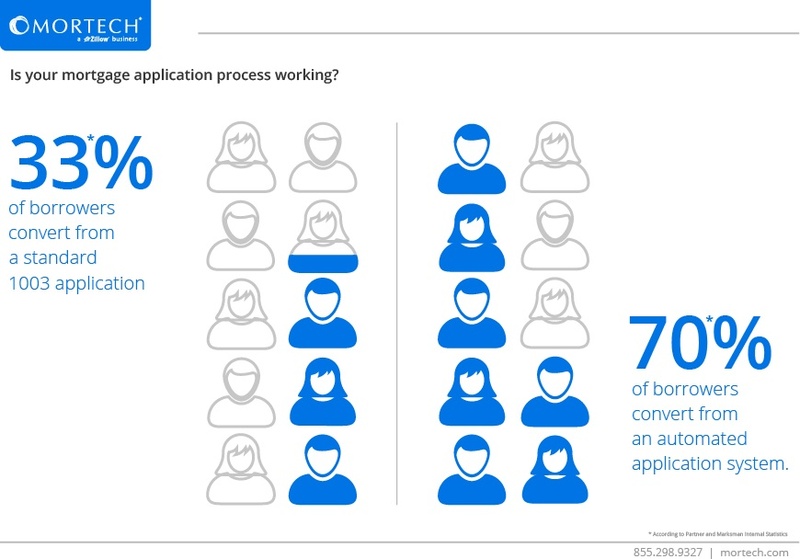 While only a third of potential borrowers that started a more traditional 1003 application process actually completed and sent in their application, over twice as many potential borrowers who sent theirs in, did so on an automated system. So how can you upgrade your process so that you’re not missing out on higher conversion rates? Let Mortech help. We’ve integrated with companies like Daric, who streamline the mortgage application process and work to save time for both the borrower and the lender. The borrower no longer has to do everything manually, and the process will automatically pull any relevant and important data that is readily accessible, and the lender no longer has to spend countless hours helping the borrower through the process and sifting through physical applications. Once the borrower submits the application, they can check the status, load required documents, and digitally sign certain disclosures all from within our partners’ consumer dashboard. This cuts out a lot of unnecessary work for the lender, and gives the borrower access to both information about their application, as well as means of furthering the process on their own, resulting in an automation process that goes beyond just filling the application out. Upgrading your mortgage application process may be an often-overlooked step in improving your lead conversion, but it’s one that lenders should be taking seriously as technology and automation plays an increasingly important role in the mortgage industry. To find out more about how Mortech can get you started on this process, contact us today, and we can start saving you time, and improving your borrowers’ experience.